A versatile powerchair which is perfect for those who are looking for something efficient at an affordable price. Price excluding VAT.(Incl. VAT £4,224) *VAT Relief available on this product. 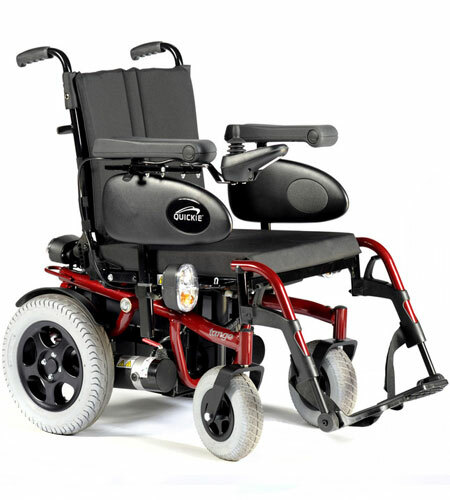 The QUICKIE Tango has been designed for those who are looking for an efficient power wheelchair at an affordable price. The seating system is fully adjustable, so you’ll always find the most comfortable position. The 17” seat can be moved outwards to 19.5” or inwards to (15”), and the backrest height and angle can also be changed too! As an optional extra, the Pro Comfort seat can be added. It is slightly contoured for positioning and padded for extra comfort. There is an easy clean wipe down cover for your convenience. A new generation of articulating dive wheel suspension will give you extra traction when moving across rough or uneven terrain. It also works to give you a smoother ride when compared to other rear wheel drive powerchairs. Due to the compact size, it is highly manoeuvrable making this chair excellent for use in a house, flat, or bungalow. It’s also a good chair to use outside, whether that’s in the garden or a quick trip to the shops. This powerchair is rather heavy to be lifting in and out of car boots on a regular basis. It has been designed to work extremely well with hoists when transferring to and from a car boot. For safety purposes, the Tango has been through rigorous crash testing. As standard, you’ll benefit from a tilt-in-space function which will help with a comfortable seating position and pressure redistribution. These features combine to provide a versatile powerchair. Perfect for those who want to use both indoor and outside. Available in silver, red, and blue. If you would like any information on the Tango or any of our powerchair range, then please give us a call on 02392 255600 – we’d be more than happy to help.